The Lenovo S90 Sisley has a unibody contruction with a glass front, aluminum chassis and very little plastic and just looks premium. It’s curved design is also very pleasant to hold, not just behold. The Sisley is built around internals that are befitting a midrange smartphone and not as much an iPhone killer. It packs a 5″ Super AMOLED of 1280 x 720px resolution and a near-Retina density of around 294ppi. Inside it houses a Qualcomm Snapdragon 410 chip with 64-bit credentials, either 1GB or 2GB of RAM, 16GB of 32GB non-expandable built-in storage, a 13MP 1080p-capable main camera along with an 8MP front-facing one that interestingly enough has its own LED. Take a quick look of the Lenovo S90 Sisley in front of our camera and a quick comparison between it and the Apple iPhone 6. 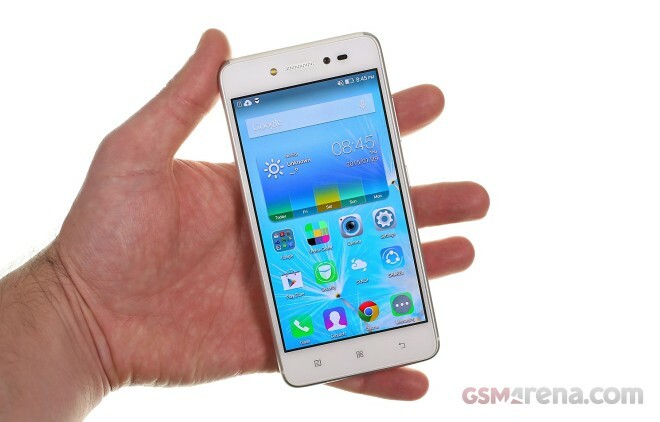 The Lenovo S90 Sisley sits in between the smaller Apple iPhone 6 and the bigger iPhone 6 Plus. It’s clearly built to be compared with the 4.7″ iPhone 6 and offers some impressive highlights compared to it. Lenovo claims it’s exactly the same thickness of 6.9mm and weighs the same 129 grams. All the while the Sisley has a bigger 5″ Super AMOLED display on the front as well as two camera modules and two LEDs on both sides, a bigger battery and a pair of microSIM slots. While the Lenovo SIsley and the pair of Apple iPhones look alike the Sisley has somewhat less of a sophisticated feel – the materials used are pleasant but the craftsmanship isn’t up to the same standards, but that’s to be expected given the difference in price. That’s not to say the Lenovo Sisley is cheaply made. The aluminum chassis feels stone-cold and precise in the hand and has a nice non-slip surface. The plastic lines ensuring antenna reception are better-looking compared to the non-flattering ones on Apple’s latest gadgets. The 5″ Super AMOLED display isn’t as sharp as the one on the iPhone 6 on paper but looks almost as good side by side. The vivid AMOLED is also a pleasure to gaze at and exhibits the usual standard-setting qualities such as superb contrast. The panel is bright too and doesn’t suffer too much color shift when at an angle. We’re yet to evaluate the full potential of the Lenovo Sisley but are en route to bring you our dedicated review by the end of the week.